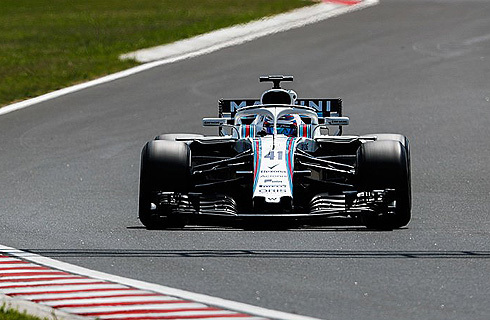 The Williams Martini team would return to the Hungaroring track for two days of testing. Carrying out the driving duties on the first day would be Oliver Rowland, the teams Official Young Driver. The most notable thing that the team ran on the car was a 2019 specification front wing. It certainly drew a lot of attention as the team spent the morning running with this wing, with the wing made even more visible by the colourful Flow-viz that the team had sprayed onto it. The afternoon would see the team revert back to the 2018 design but was hampered by rain and red flags. 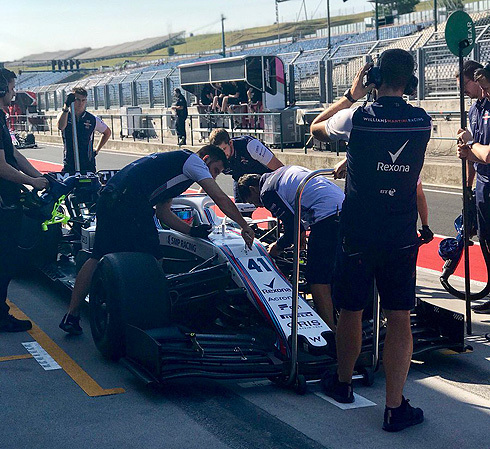 The Williams Martini team would commence their two days of testing at the Hungaroring circuit with Oliver Rowland carrying out the driving duties. He would be replaced by Robert Kubica on the second day. 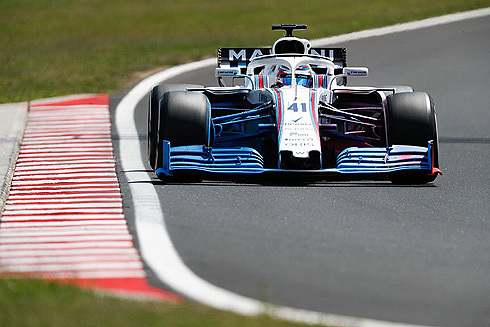 One of the most notable things that was seen on the Williams car was the trialling of a 2019 specification front wing. The wing is vastly different from the 2018 model in terms of the number of elements and the shear complexity of the wing. The new wing is aimed to improve overtaking. The 2019 wing will need to be 200mm wider and 25mm deeper than the 2018 model. Williams chief technical officer Paddy Lowe confirmed the team would be trialling development parts in the test and said it would "probably" run a 2019 wing. "I think everyone else will probably be doing similar things," said Lowe. "We'll be doing some experiments around next year's rules. "It's the last opportunity in certain areas to do that because you can't run a car to a different rule set on Fridays." As for the test Oliver Rowland would complete forty three laps in the morning session of the day. He would record a time of 1m:21.594 during his running. This was 1.9 seconds off the quickest time but this is to be expected. He would spend his time on the track running with the medium tyre. The afternoon session would see Oliver continue running but he had switched to the 2018 front wing. He would run aero tests in the early part of the session with the car running with measuring devices in front of the left rear wheel. But the session would be red flagged due to one of the other drivers crashing his Torro Rosso. Oliver had now completed over fifty laps in his running with the FW41. The session would restart but shortly after rain would start to fall seeing the track empty. After a short shower drivers would start to return running on intermediate tyres. 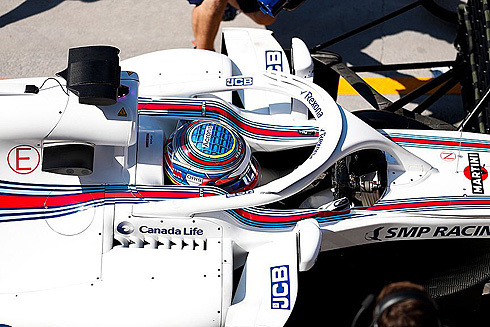 As for Williams they would complete their day with Oliver had done sixty five laps. His best time would be on new tyres late in the day when he would set a 1m:20.970. Rob Smedley, Head of Performance Engineering: It was a good day for the team. We had spent a long time preparing for this event, concentrating on 2019 aero regulations. The team did a good job to prepare for it and everything went more-or-less according to plan, and we collected all the data we needed. We brought a 2019 aero specification front end, and all of the data that we were able to collect will really enrich the 2019 programme going forward. Oliver did a great job, he got on with it, was very professional and diligent and went through all the data gathering runs. He was unfortunate with the weather at the end of the day when it started to rain, as we had just got onto a clean car, so he hasn’t really put in any timed laps. But, he certainly impressed us all with his work ethic. Once we did get onto new tyres at the end of the aero testing, he did a really good job and showed good pace immediately. Oliver Rowland, Official Young Driver: I think in general it went well. I would have preferred to get a bit more of a run at the end when the rain came in, but I can’t control the weather. Everything ran to plan for the team, there was a couple of hold ups during the day but we managed to make up for that time and the mechanics did a job to get everything fixed and fitted in certain times throughout the day. From a team’s perspective we gathered a lot of data and it was positive.